It cannot be stressed enough but the corner stone of a democratic society is having the right to use and exercise a vote with elections and referendums. True, the confusion of who to vote for can put many people off using this, but its important to remember that many throughout the world have and will probably still die fighting to have this right. However, in my own experience, there is a problem in exercising this right and this centres around being engaged in the whole voting process. Some may say that there is nothing complex about joining in on this, but over the years I have experienced barriers that have at times put me off voting altogether. Why? Well, the practicalities of accessing the registration forms, candidate campaign literature, ballot papers and polling stations themselves as a totally blind person has been akin to walking through quick sand and also fighting against a very strong head wind – okay a bit overdramatic but I’m sure it makes the point in the end. Engaging all areas of society in the voting process is essential to further strengthening our democracy. In the past (I have lived in a number of areas up and down the country), these barriers have included print registration forms being thrust at me and being told to fill them in; even though I pointed out my sight loss and lack of support in being able to do this. I could have also filled several skips with the amount of printed election information that I have received through the various doors that I have lived behind. It wasn’t until I started living in Mirfield that I actually had election candidates come to the door to campaign for my vote. Polling stations, ah yes, now they have come in different shapes, sizes and locations and each with their varying levels of accessibility and assistence. Honestly, I would prefer to go in person to cast my democratic ‘X’, but again, I would have done this consistently if I’d known where to go, had the confidence of receiving assistance when I was there and also knowing that I could do this in private. Accepting the right kind of help is great and I certainly encourage it, but telling someone who you want to vote for is something that I would prefer not to do. Many groups, who are eligible to vote, are missed out of this democratic process simply because the access barriers are not fully understood. Politicians and decision makers need to understand that engaging people in the voting process is crucial to enhancing democracy and true representation. Additionally, to clear any misunderstanding and misperceptions, the best thing to do is to talk honestly which in turn will create a greater understanding where access is delivered effectively and realistically. I want to vote on May the 7th because I fully believe in the democratic process. I’m going to try and do so, but the problem of finding my polling station and what I will find there when I eventually reach it is playing very much on my mind. We’ve started election week 2014 with a visit to the opening of the postal votes. 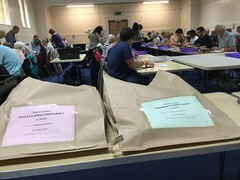 The elections staff have been hard at work for weeks getting everything ready for the Local and European elections on 22nd May. The work doesn’t just start on polling day – it’s a huge operation. 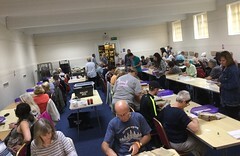 For example, the process of opening all the postal vote envelopes takes several days and the work is already well under way. Are you a postal voter? Remember to return your postal vote so that it can be counted. 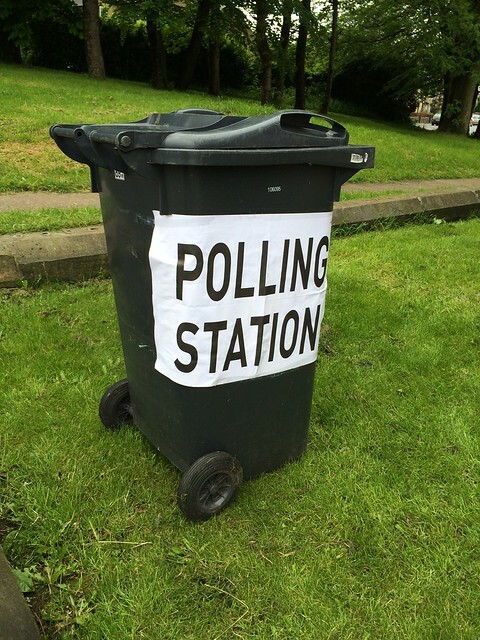 Postal vote envelopes can also be handed in at any Kirklees polling station on Thursday 22nd May. Votes can be accepted right up until the close of polls at 10pm. The first results for the local elections in Kirklees are starting to come in. The Liberal Democrats have held Almondbury. The Conservatives have gained Lindley from the Liberal Democrats. Labour have held Dewsbury East. Labour heve held Batley East. The Liberal Democrats have held Cleckheaton. The Green Party have gained Kirkburton from the Conservatives. The Green Party have held Newsome. We’re here at Huddersfield Sports Centre awaiting the results of the 2012 local elections in Kirklees. Looks like low turnout might mean results sooner rather than later. In the meantime, the candidates are all busy observing the counting, but we’re hoping to speak to some of them soon.